The JF Series has a color monitor to view images clearly and with greater detail, at black and white video prices. In low light conditions, the video door station’s built-in white LED illuminators will activate. Identify visitors even at night. When a call comes in, press the TALK button to begin hands-free VOX (voice operated exchange) communication. The LED lights turn on when talking to visitors and turn off when listening, making communication easy. Controlled entrances, interior offices, retail stores, parking garages, loading docks, and employee only areas. Primary and secondary schools, college campuses, controlled entrances, service areas, and faculty rooms. Local, state, and federal government branches, courtroom security, airports, and embassies. Hospitals, medical clinics, administrative offices, exam rooms, nurseries, pharmacies, and staff lounges. Single-family residences, gated entries, housing developments, and multi-tenant buildings with individual entrances. Easily record and play back a short message for someone or a reminder for yourself using the Voice Memo feature. Up to 3 voice memos at 15 seconds each can be recorded. Automatically record images of visitors who press the CALL button or manually record images anytime by pressing the REC button. Only 2 wires to connect between door station and master station. Send a call out to all inside stations with 1-button answer back. When environmental conditions are dim, these LEDs automatically turn on so visitors can still be seen, even in the dark. Remain anonymous. Pre-record up to 2 audio messages to be manually played at a door station when anyone inside chooses not to be identified. Discreetly keep an eye out for suspicious behavior through the door station lens. 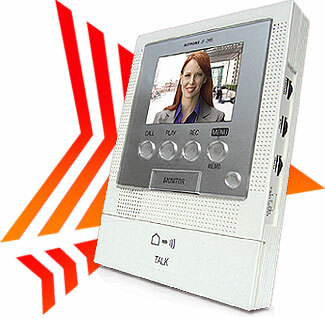 Simply push the button for VOX communication or hold down for Push-to-Talk.